Receiving a treatment surrounded by nature is an incredibly relaxing experience, especially when there is an unforgettable view of the water. Scents of massage oils combined with the scents of salty ocean air charge you with positive energy while your muscles relax under the skilled hands of a massage therapist. Our list of spas with best ocean views includes secluded getaways, tropical island resorts and one-of-a-kind overwater cabanas. Receive a treatment right over the water in this overwater cabana at the Shangri-La Villingili resort. 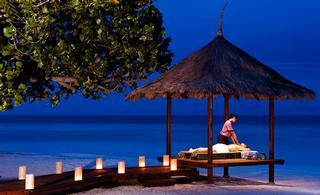 Enjoy soothing ocean breezes and clear air as you receive a massage that's healing for the mind and body. 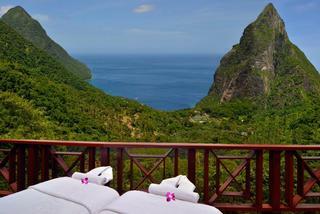 Couples and honeymooners should book a massage side-by-side with magnificent views of the Pitons in St. Lucia. Ladera Resort is one of the top romantic places to stay in the Caribbean. Located on its own little island right next to the famous St. Mark's Square, Hotel Cipriani Venice is ideal for honeymooners looking for privacy and five star service. Visit in the summer and ask for an outdoor treatment with views of St. Mark's square, canals and rooftops at sunset for a once-in-a-lifetime spa experience. Afterwards, have a romantic dinner at the hotel restaurant with a view. 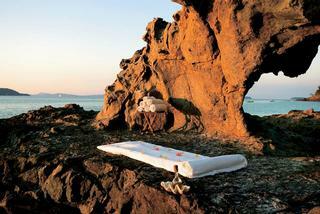 Enjoy massage and reflexology on the ocean's edge in Madagascar, surrounded by rocks and open views at Constance Lodge Tsarabanjina. The over water wellness center features oils, scrubs and wraps created exclusively for the "Spa de Constance." The newly renovated hotel is located on an island off Madagascar with only 25 guest bungalows. There is a great dive center and some of the world's best dive sites around the island. At Lime Spa at at Huvafen Fushi travelers goers have a choice of overwater and underwater treatments. When you book a treatment on the beach on Fregate Island in the Seychelles, you don't have to worry about other vacationers walking about, disturbing your relaxation. This ultra-private island measures less than one square mile in size and accommodates just a handful of vacationers at a time. The Rock Spa is set on a cliff-top plateau with panoramic views of the sea. You'll be surrounded by freshwater pools and soothing waterfalls. 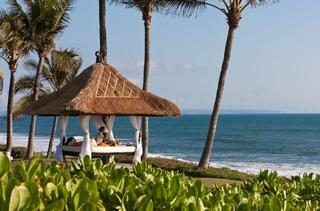 It's a great time to plan a getaway at the Sheraton Kauai which just completed a $16 million renovation. Book one of the rooms or suites with a terrace facing the ocean and treat yourself to a relaxing treatment with a view. Deep Ocean Spa at the InterContinental Bora Bora Resort is the first thalassotherapy center built in the South Pacific. Thalasso Spa offers beautiful overwater treatment rooms that overlook the island of Bora Bora. While you are getting a massage, you can watch marine life through glass floors. Relaxation areas have unobstructed views of the ocean, outdoor jacuzzi, steam baths, a fitness room and a tea lounge. Choose from a number of signature packages for one of two people. 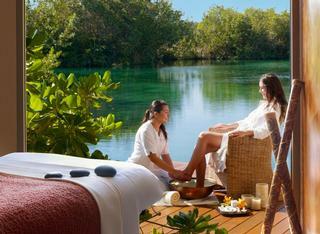 Sense Spa at Rosewood Mayakoba is situated on its own little island within the resort. This award-winning getaway lets you enjoy treatments surrounded by water and lush greenery. A hot rock treatment, reflexology, a pedicure - the choice is yours. 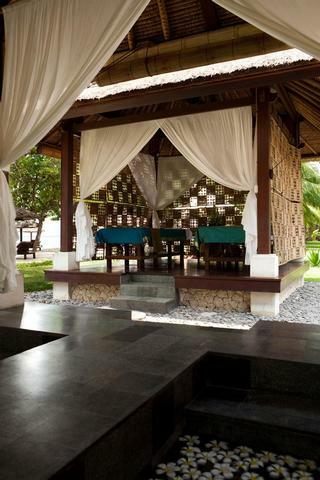 Nirwana Spa at the Pan Pacific Bali offers treatments in thatched-roof private cabanas on the edge of the Indian Ocean. You can listen to the waves and smell the healing ocean air as you receive your treatment. When you check into Correntoso Lake and River Hotel, you will be surrounded by magnificent Patagonia mountain and lake views wherever you go: your room and the restaurant. 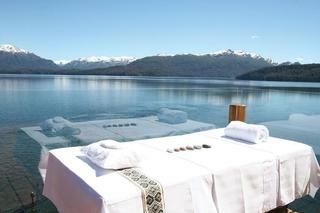 Lounge next to the outdoor or indoor pool and get an incredible outdoor treatment with scenic mountains as a backdrop. This getaway is perfect for combining adventure activities with relaxing at the spa. 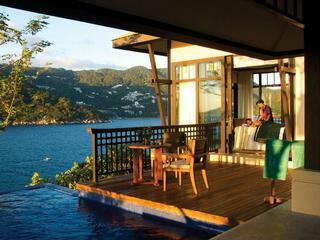 At Banyan Tree Cabo Marques, you can get a relaxing massage with open air views of Acapulco's stunning coastline. The wellness center at Yasawa Island in Fiji has incredible treatment suites that open out to the sandy beach and the ocean beyond. 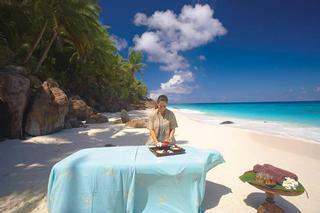 The spa is set on the edge a beautiful beach with soft white sand. You can walk there barefoot from your beachfront villa, enjoying the feeling of the sand between your toes. The Baravi Spa on Yasawa offers a a blend of traditional and contemporary treatments. Ask for the signature Baravi Rhythm, performed by two synchronized therapists. Arrive early to relax and cool off in the outdoor pools overlooking the ocean. 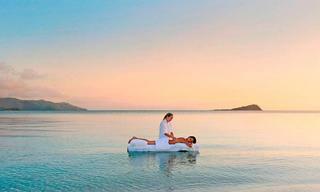 Couples honeymooning in Fiji can book side-by-side massages in a treatment suite overlooking the ocean. We recently featured Yasawa Island in our collection of Best Secluded Romantic Getaways. Get a treatment in your own private Two Bedroom Over Water Pool Residence Pavilion at Anantara Kihavah Villas. 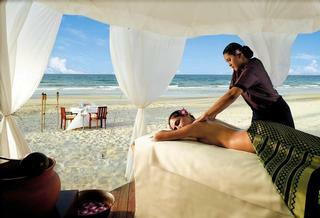 At Banyan Tree Bintan in Bali you can receive this soothing massage right on the sandy beach near the ocean's edge. This outdoor massage setup at Banyan Tree Vabbinfaru is for those who want to experience an evening massage surrounded by lanterns in a pavilion on the ocean's edge. The Hayman Island in Australia offers the Ocean Massage where you receive a massage on the water, surrounded by the water from all sides. 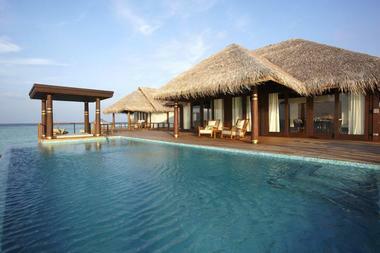 Indulge in over water treatments on stilts at the Conrad Resort in the Maldives. 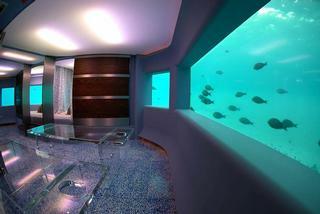 Glass floors let you watch tropical fish swimming underneath as you receive a treatment. Sign up for a couples' treatment in your private rooftop pavilion at Angsana Velavaru Maldives. Soothing island breezes combined with five star service and views of the blue lagoon create a truly unique experience. After the treatment, relax with a tea, enjoying open ocean views. Soothing aromatherapy treatments are healing to the body and mind. The wellness center has a range of scented oils available. The Beach Spa at Jimbaran Puri features traditional open-air terraces in the shade next to a sandy beach, close to the edge of the ocean. Couples can request a side-by-side massage and relax in a double whirlpool bath with ocean views. Treatments are offered in the privacy of your suite or villa as well. 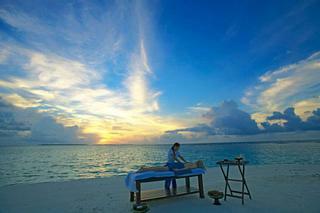 Dhonakuli Maldives can set up a massage table on a private stretch of a sandy beach. Whether you want a sunrise massage or a sunset massage by the water, all you have to do is ask. 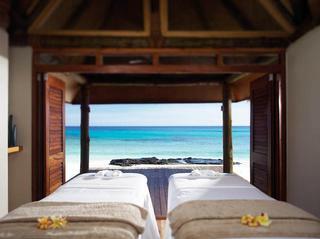 This treatment room on Necker Island is elevated above the ocean to give you spectacular views of the blue horizon. 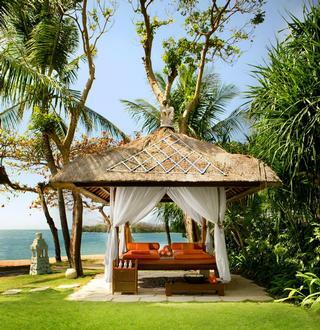 Enjoy a rejuvenating treatment at the Westin Nusa Dua Bali with views of the beach and the water.